Ask most anyone who has been to Santorini and they will invariably refer to it as the most beautiful vacation spot they have ever visited. “Heaven on earth”, is a frequent comment. It is the perfect place to propose, get married, renew vows or enjoy an unforgettable honeymoon. It is the perfect vacation destination for almost everyone! Santorini is one of the many Greek isles off the country’s southeastern coast. The island is the remains of the rim of an ancient volcanic eruption. From a distance it appears as a bleak hunk of black rock with a hint of green (vegetation) and white (buildings) clinging to its heights and threatening at any moment to drop over the perpendicular cliffs into the blue waters of the Mediterranean below. But therein lies its magic. Most folks approach the island from the sea though you can fly into the airport at Kamari. Whether you arrive by cruise ship or ferry, you will have to navigate the almost vertical climb to the top. 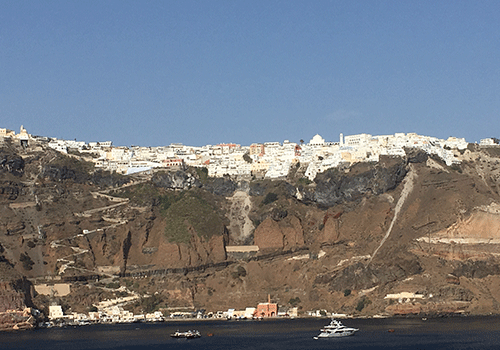 There is a cable car in Fira, the capital, below which most cruise ships will anchor, or the hair-raising switchback road to the top from where the ferries dock. Either method is a good excuse for hand holding, especially if you dislike heights! 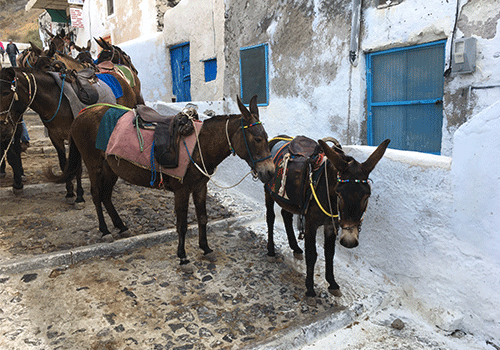 If you want the adventure of riding donkeys from the beach to the top in Fira (or even climbing the donkey trail), that is an option too and might be an event to look back on in years to come. Note, the memory of the smell might have left you by then but seriously, it is not recommended. 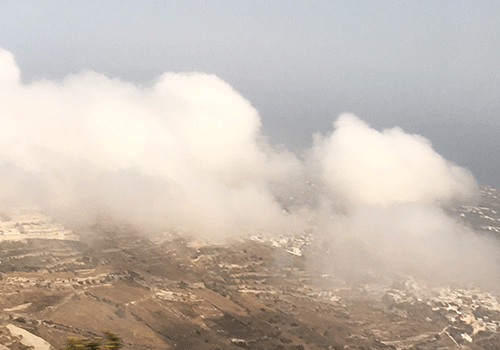 Santorini, besides having the various towns and villages along the coast, has an extensive inland portion where you can climb even higher and witness wispy clouds floating by below. From these lofty perches you can survey the numerous wineries, scattered houses, and the sea beyond. Many wineries offer wedding venues, and the ones overlooking the sea provide a stunning back drop for photos of the day. In addition to wineries, there are many villas, hotels, chapels and dedicated venues available for the wedding of your dreams. 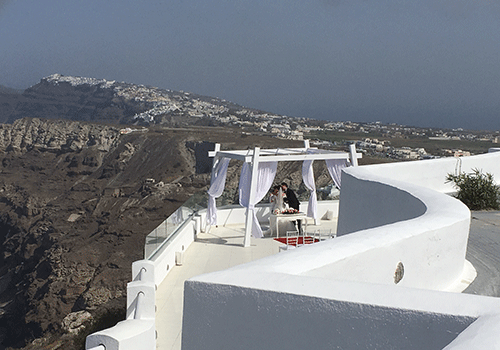 Whether you tie the knot on the island or have done so many years before your visit, picture yourself in a cool cliff-side suite with private endless pool, the brilliant sunshine bouncing off the white walls of the surrounding buildings, and blue domes reaching for the skies. Or dining by candlelight with the nighttime stars reflecting on the dark waters below. Or wandering the up and down, twisting alleys of Oia shopping for that perfect souvenir. Or stopping to take a selfie with the backdrop of the blue and white town and the sea with its miniature-looking ships. If you like to explore, Santorini has beaches, though don’t expect white sand. The beaches are of the pebbles-and-black-sand variety primarily. But the swimming is good. And there are ruins and museums for the history-minded. But truly no one goes to Santorini for the swimming, delightful as it can be, or for its past. 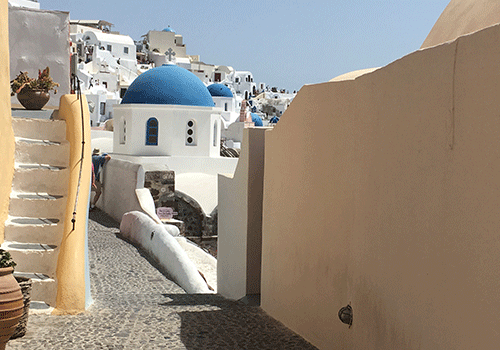 Visitors flock to Santorini for the remarkable views, to stay in hotels and shop in stores perched on cliffs, to savour Greek food and wine, and feast on the busy but friendly atmosphere. If you wish to visit Santorini on a quick day-long stop on a cruise, consult your travel adviser for recommended excursions to enjoy the best of this island. And for longer stays, whether it be for a special event or for just a romantic or otherwise getaway, your travel professional can help create the experience of a lifetime. Photos courtesy of Compass Media. Your view above the clouds !